All my little friends, there is a ebook pdf file of Kishor Bharati patrika. 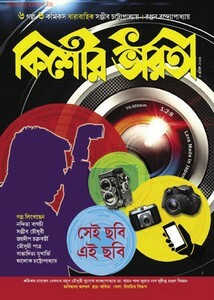 This excellent Bengali children magazine disclosed by Patrabharati from Kolkata, West Bengal. Now you can get a pdf file of Kishor Bharati 5th April 2016 issue. This issue's main articles are That picture This picture, six stories and six comics, Rhymes and poems etc.